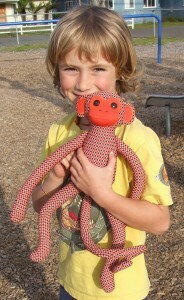 It was well over a year ago that a friend of mine requested a Monkey for her little boy who loves them. Eventually, after mulling it over for some time, and looking at lots of monkey and monkey toy images on the internet, I came up with this monkey design. 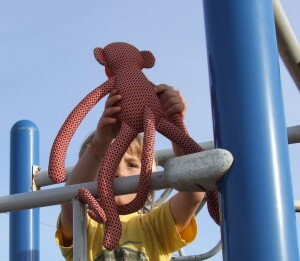 The ball got rolling when I took inspiration from the sock monkey on how to do the muzzle. I decided I’d make the muzzle like the toe of a sock and start from there. 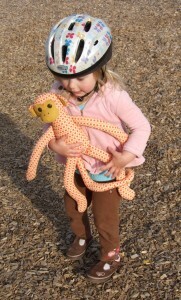 Then followed all the fun monkey details: the opposing ears, the heart face, the long limbs and the curly tail. The design just came together. Sock monkeys have some stretch so I boldly decided to try some of my much-loved but-rarely-used double-knit polyester for the prototype. I had this adorable orange and brown checkered stuff that I was excited to try. Well, everything about the design was time-consuming, if not downright tedious. Assembly, in particular, involved a lot of fussy finagling to get things as I wanted them. The spiral tail, the hand-sewn muzzle, getting every part positioned correctly, all these things turned out to be harder than I thought. Despite being a lot of tedious work, the polyester worked well and I LOVED how the monkey turned out. I vowed to try to make as many as I could bear while the inspiration and process were fresh. I knew from past experience that I make things in batches and then I am over it. And once I’m over it, I’m over it. 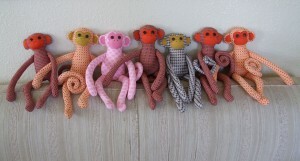 And since the monkeys were so fussy, I knew after I finished them, it may be a long time, if ever, before I could bring myself to make one again. I completed 7 and was very proud of the accomplishment. 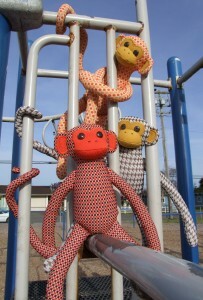 I love them dearly and never want to make another monkey as long as I live. I sent one of the orange-and-brown ones off to my friend’s little boy, Kristopher, and he loves it, so I guess it was worth the wait. My kids each claimed one and they really have a lot of fun with them. Owen likes to hang his from its tail, and Ruby loves to dance and run races with hers, dragging it along. 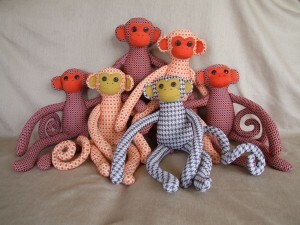 My friend suggested I develop an official pattern for the monkey. That way, if someone really wants one, they can make it themselves, instead of asking me to make one. And while it is a good idea, I feel intimidated by the prospect of describing the process of making one, since so much of the process involved finessing. Even down to the last monkey, I never felt like I had easy control of the outcome. It made me feel like I should take a class; maybe there are some tricks. As much as I’ve sewn, I am mostly self-taught and don’t have all the tricks under my belt. I rarely follow real patterns, choosing instead to draw out my own on brown paper bags. And there have been many times when I’ve learned a technique for something I was going about the hard way. Anyway, these have been a long time in the making and I am finally getting around to posting them. 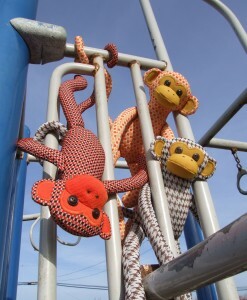 I still want to do another playground photo shoot, and am toying with the idea of developing a kid’s book with them, before the rest of the monkeys find homes. I can’t believe how much personality you squeezed into those monkeys! Treasures, for sure. They are absolutely fabulous!!! 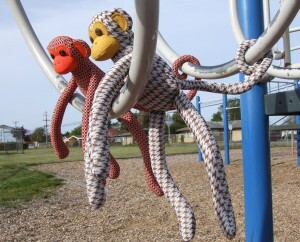 Love the playground shots! You should do a kids book with them. You have really good writing skills.